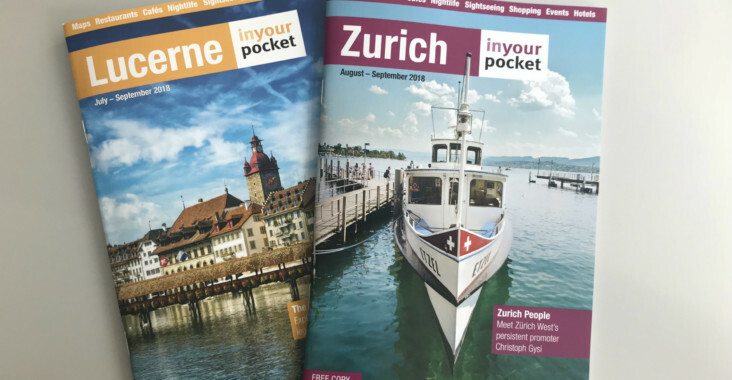 Before we will go on a well earned summer break we managed to publish the latest guides to Lucerne and Zurich (click the city names to download the pdfs). And while with Zurich we approach the anniversary issue no. 50 in huge steps (how time flies! ), we made it in Lucerne to no.14 already. It’s summer, so we obviously got you covered on all the latest open-air bars and summer activities in both Swiss cities. As usual we visited a bunch of new restaurants, bars and shops and reviewed them for you (see below). In our series Zurich People we introduce Christoph Gysi this time. As president of Vereinigung Kulturmeile Zürich West and owner of the restaurant Les Halles, he is one of the biggest promoters of the former industrial district Zurich West. He talks about the future of the district and reveals his favourite Zurich restaurants, bars and spots. In Lucerne we followed the foosteps of the Swiss national hero William Tell and tell you how to explore the sights of his legendary fight for freedom. Enjoy reading the latest In Your Pocket issues – and more importantly enjoy summer! I have lived in Zurich for nearly 15 years now. As editor and general manager of Zurich In Your Pocket i made sharing my knowledge of the city my profession in 2010. I love dining out, craft beer and tennis. And exploring Zurich of course. Lukas Füglister on We’re 50 in In Your Pocket years! Małgorzata Drząszcz on We’re 50 in In Your Pocket years! Copyright © 2019 Switzerland In Your Pocket blog. All Rights Reserved.